Many factors cause Maryland weather to be quite changeable and unpredictable, with major extremes in both weekly weather patterns and year to year trends. Proximity to large bodies of water like the Atlantic Ocean and the Chesapeake Bay; the mountains in the western part of the state; and a location that exposes us to wind and cold from the north, as well as moisture heavy systems coming up the coast, and remnants of mid-western storms all contribute to these fluctuations. 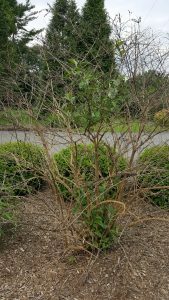 This situation can sometimes wreak havoc on trees, shrubs and lawns (although the weeds seem to survive through it all). A little knowledge of the way different weather situations can affect your plants may help them survive the ups and downs of our regional climate. Yearly patterns in the recent past have included severe drought and excessive precipitation. Both situations call for monitoring of existing plant material and caution with installation of new plantings. Temperature trends also have a significant effect on plants. A warm spring and hot summer with little rain is a questionable time for tree digging and planting unless monitored watering is available. Daily weather events can also affect plant health. Maryland often experiences violent storms that include high winds and heavy rain that can tear up or topple trees. Some advance preparation can limit the damage caused in these storms. weeds in the spring. Consider installing or using systems that conserve water, such as drip irrigation in shrub and flower bed. Younger trees or new plantings can benefit from the use of Gator Bags. These provide slow, steady watering over a number of days. screened from wind with burlap or buried in leaves loosely placed inside wire mesh. 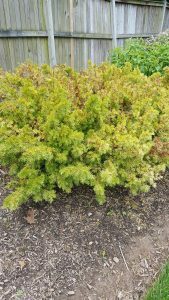 Evergreens can be helped by keeping them watered into the fall. Anti-desiccants can also be applied to evergreens to retain moisture, although this is not always successful depending on conditions. inches and compressing a soil sample in your hand. If there is no moisture the plant requires watering. Over-watering can damage plants as well, so monitoring and moderation are the best course to take. 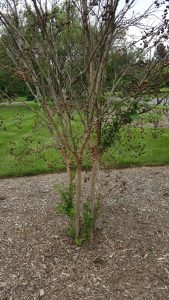 Any of these issues may indicate a need for pruning or removal. Although having trees pruned or taken down can be an unwanted expense, the damage caused during a storm can be much more costly. If you have concerns about plant health or think your trees may become hazardous during a storm, call Mead Tree & Turf Care for a professional evaluation. Our licensed arborists can help you assess the best treatment for stressed plants and determine ways to reduce potential property and tree damage that can be caused by storms.